The organic gardening movement has been long established among vegetable growers. With the mainstreaming of ideas about environmental and ecological preservation, the organic movement has come to ornamental gardening. And one of the primary spokespeople for that movement is Sasquatch's longtime author Ann Lovejoy. 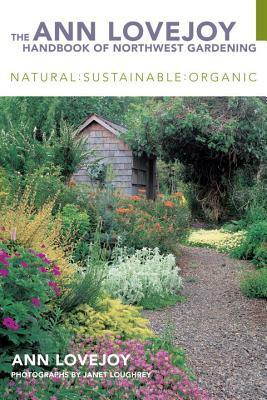 This new book is a complete handbook for ornamental gardening follows the principles and techniques of organic and sustainable gardening. Gardening naturally does mean going without products like Roundup, Weed and Feed, and chemical fertilizers. It also means that gardeners may opt for a selection of native plants that are compatible with local climate and soils. Some of the paradigm shift has to do with getting over the notion that one's garden needs to be as spotless and tidy as something on a magazine cover. Gardening is all about process, and the methods that Ann Lovejoy explains in this book emphasize good soil preparation, composting, drainage, mulching, and right plant selection. This comprehensive book covers the steps from landscaping and designs to soil preparation to planting beds. She covers all of the elements of the garden: ground covers, lawns, shrubs, bulbs, trees--all with an eye to building a sustainable garden that grows without chemical fertilizers and pest control. You can try to make an Arizona backyard look like a Connecticut estate, but it's going to take a lot of work, constant maintenance, more water than all the other gardens on your block, and a fat checkbook. There's a simpler, more gratifying way to garden that is also good for people, pets, and wildlife. This practical book tells gardeners how to achieve that. Ann Lovejoy is a weekly garden columnist for the Seattle Post-Intelligencer and the author of 18 books. She lives on Bainbridge Island, WA. Photographer Janet Loughrey lives in Portland, OR.